For those of you that follow me via Pinterest my very favorite board is my DIY Inspiration Board. This is the one where I let myself pin literally whatever I love when it comes to rooms. This is the board where all of the pins (at least for me) come right out of my dreams, like places from a fairy tale. My own home is a little less frilly, a little less boho, a little more subtle as I simply do not yet have the salt to be quite so bold. However, I am getting there, for every gorgeous place I pin, I am definitely becoming more bold and reaching for the true beauty of places like these that make my heart sing. Everything about this bathroom makes me want to be there. I love that nothing here is perfect, if this was a “Setup” by a designer or whoever just for this picture then they totally have me fooled. 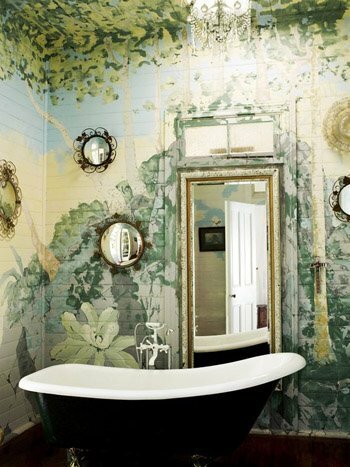 This bathroom looks LIVED IN in the most fantastic way. It looks loved and it looks like every picture and mirror on the walls were hand picked and purchased and placed simply because one single person wanted it to be there for no other reason other then that they liked them. The casual curtain, the little cabinet that almost (but doesn’t at all) match the bold paint color on the walls. 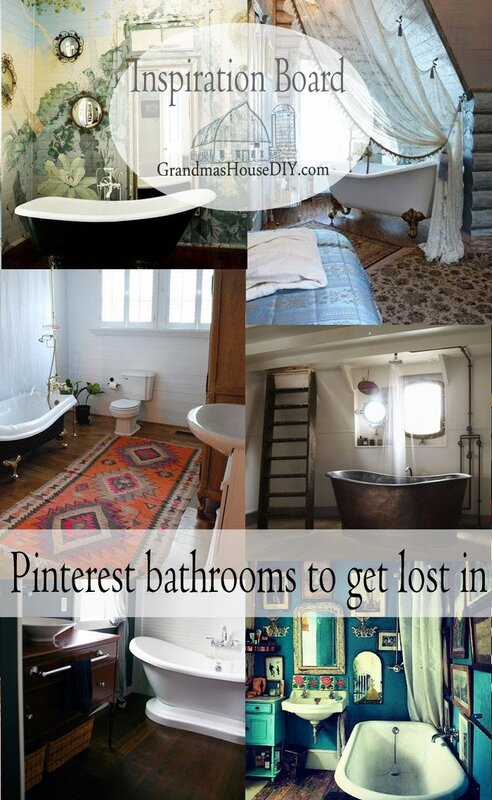 This is absolutely the bathroom I could enjoy entirely without worrying about messing anything up. Oh be still my fast beating heart for that tub is something straight out of my dreams. 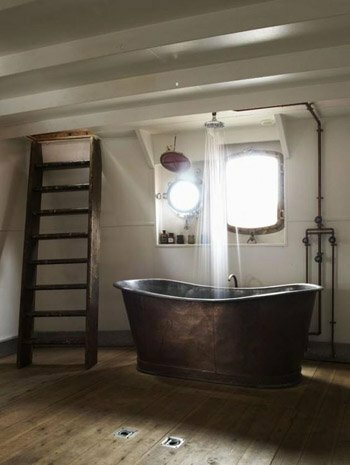 This bathroom feels old and as though it could be the front hull of a ship with the only access a hand made ladder created many many years ago. Even the plumbing doesn’t look like something purchased to look old etc. No, it looks MADE, with no desire whatsoever to cover itself up because, in all of its practical splendor, it is beautiful. Is it just me or does the rumpled gorgeous rug here absolutely make this room? 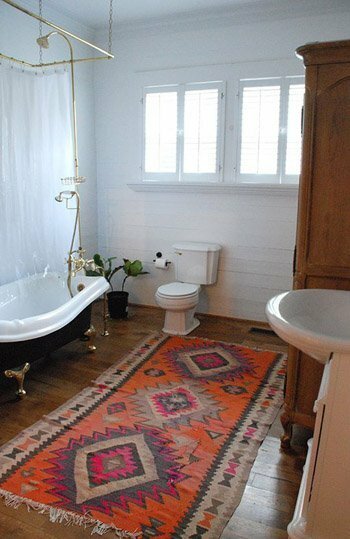 I love that they didn’t fix the rug so it was “perfect” because, goodness knows, if this is a bathroom that is ever lived in, the rug would never be perfect. Nor would the shower curtain or anything else. This is a bathroom made to be used and in that essence, it is absolutely stunning. Oh my goodness, no I will never be so bold as to do that on any of my walls but I can still say that I am utterly stunned by its beauty. 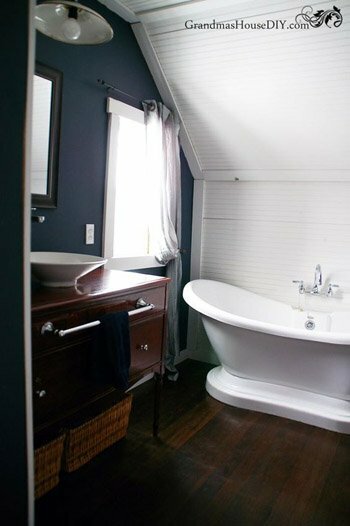 It looks as though the mirror behind the tub is actually taking the place of what was a door and the casual choice and positioning of the other mirrors on the walls leaves the impression that you are not, in fact, inside at all, but have stepped over into some kind of fair tale. 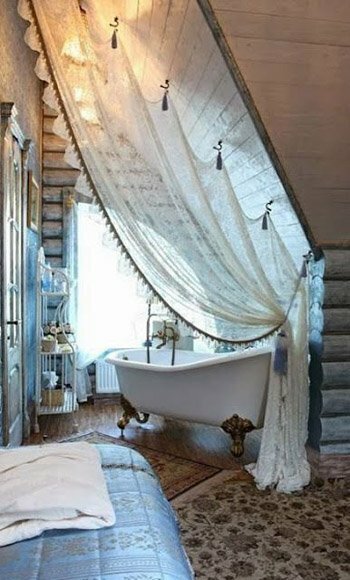 And that tub, totally swoon. 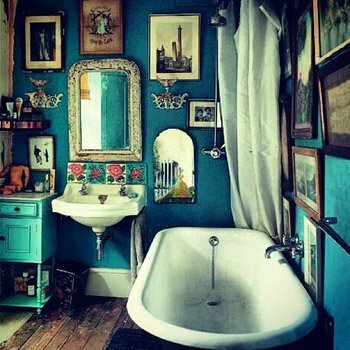 I imagine the lady of this bathroom to be a little like me in a way, both longing for lovely fair tale like things but still rustic and practical. At first glance this beauty of a room is not rustic at all however, if you look close, this is a room in a log cabin second story fancied up in a way that, if I had not seen it, I may not have believed a cabin could look so decadent.